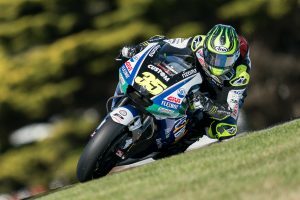 The LCR Honda CASTROL Team can provide an update on the condition of Cal Crutchlow who suffered an ankle injury at the Australian Grand Prix on Friday. The Briton rider crashed out at the first corner of the Phillip Island circuit, sustaining damage that ruled him out of the remainder of the MotoGP event. 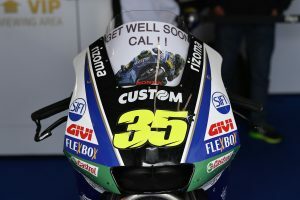 “Cal arrived at Alfred Hospital by helicopter very quickly after the crash and his initial treatment in the medical centre at the race track. We are very grateful for this because, despite his serious injury, it was not compulsory, but everyone was very keen for him to be taken to hospital by helicopter. Once he arrived, he had a full body scan which confirmed that the only part of his body injured in the crash was his right ankle. The fracture he sustained to it involved both the ankle malleolus and distal tibia. Dr. Lazarus and the surgery team led by Dr. Edwards – who successfully operated on the right ankle of Dani Pedrosa many years ago – carried out a first procedure which was a fracture reduction and alignment and external fixation with the use of a cage. This first surgery took 45 minutes and was simply to put the bone back into the perfect position for a second operation. That will take place on Wednesday or Thursday once the swelling to the ankle has gone down and will most likely involve inserting three small plates to keep the bone in place and guarantee the best possible recovery. The plan is that he will then be discharged three days after the second operation, which is next weekend.